When it comes to fighting breast cancer, mammograms are often considered the first line of defense. And yet, anyone who has had a mammogram knows the gut-wrenching anxiety that comes with waiting for the exam results. 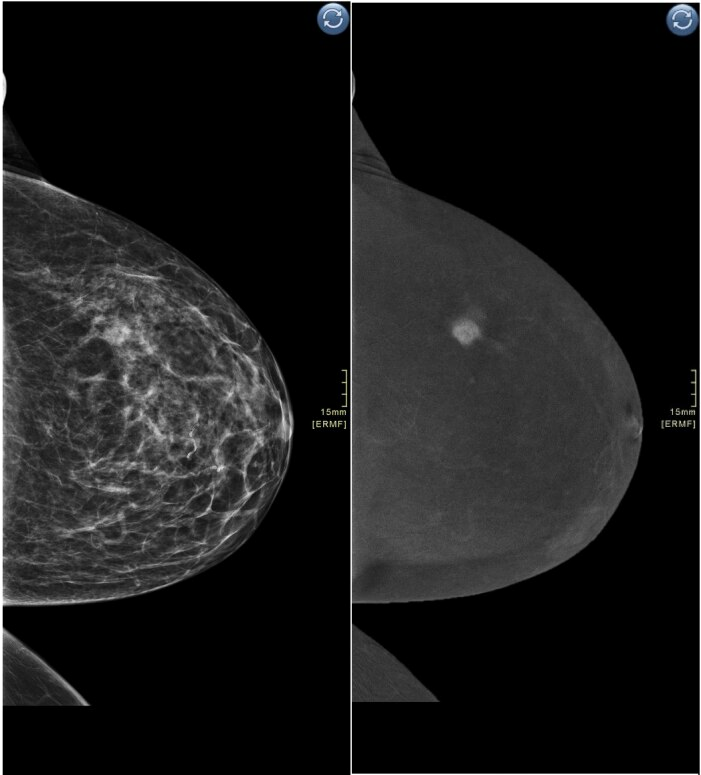 If the mammogram is labeled “inconclusive,” that anxiety skyrockets to a new level. Terrible thoughts start racing while waiting to hear from the doctor, unsure of what’s to come. Simone* recently found herself in a similar situation when she went in for her annual mammogram. 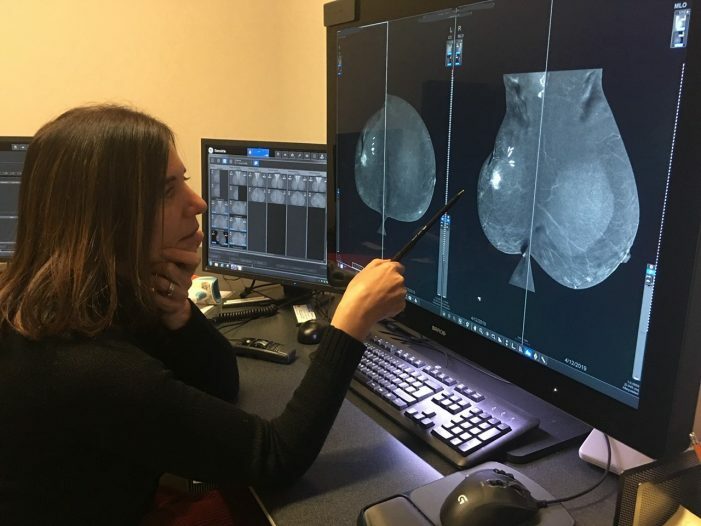 Shortly after her exam, she learned that a mass was detected in her right breast, along with scattered areas of density, which can hide cancer on a mammogram. Her doctor immediately suggested an alternative diagnostic exam called contrast enhanced spectral mammography (CESM) to help Simone’s doctor better understand what was going on. Within 30 minutes, her doctor confirmed that the disease had in fact spread beyond what was shown in the mammogram – specifically in the axillary lymph nodes. That morning, they made a treatment plan, and while Simone felt nervous about the results, she understood the necessary next steps to fight and conquer the disease. And most importantly, what used to take days had only taken a few hours. 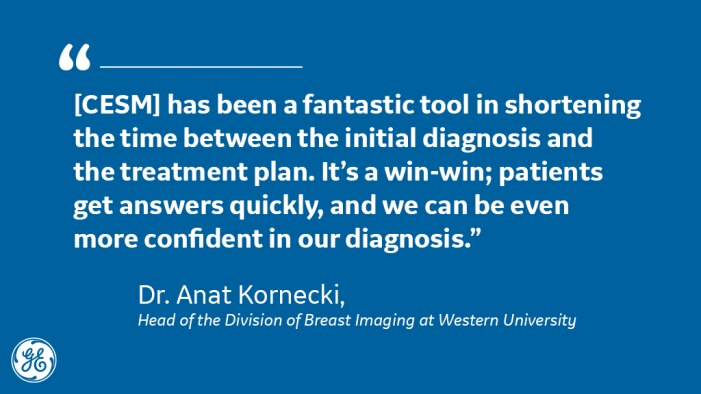 Dr. Anat Kornecki, head of the division of breast imaging at Western University in Ontario, Canada, recently incorporated CESM in her practice to enable her team to make faster assessments. With this new tool, Dr. Kornecki can offer answers to her patients more quickly, so they don’t have to wait as long for additional exams or procedures. Performed as an adjunct to inconclusive mammography and ultrasound, SenoBright™ HD (CESM) from GE Healthcare highlights areas of unusual blood flow patterns – all in a simple and quick procedure. CESM also offers a high level of confidence for clinicians and patients because it delivers clear image quality as the contrast agent highlights areas of unusual blood flow. Another key advantage is that the exam can be performed in less than 7 minutes – using the same mammography equipment, in the same room, with the same staff. The team at Western University quickly realized that the benefits extended to the entire care team. For example, surgeons feel better equipped with the results of the CESM exam, so that they have a solid roadmap going into surgery. In the last 18 months, Dr. Kornecki and her team have completed more than 1,100 cases using CESM.